CBSE CTET 2019 Syllabus Check Here. CBSE CTET Answer Key 2018 Check Here. CBSE Notification is out. 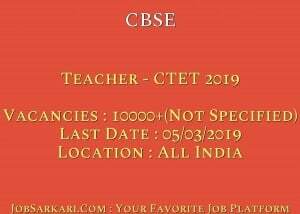 CBSE is recruiting for 10000+(Not Specified) Teacher - CTET 2019 (Correction Form) Posts. You can check CBSE - Central Board of Secondary Education last date, download CBSE notification, visit CBSE official website and check other CBSE Vacancy details.Complete Vacancy and recruitment Details about 10000+(Not Specified) Teacher - CTET 2019 (Correction Form) vacancies in CBSE are provided below by JobSarkari.Com only for you. Last Date for Apply Online Online 12/03/2019. Last Date for Payment of fees 08/03/2019. Gen/ OBC (Only Paper I or II) Rs.700/-. Gen/ OBC (Both Paper I & II) Rs.1200/-. SC/ST/PH(Only Paper I or II) Rs.350/-. SC/ST/PH(Both Paper I & II) Rs.600/-. Graduation in any discipline and appearing in the final year or passed the 2 years Diploma in Elementary Education (D.El.Ed.) Not Specified. Graduation with at least 45% marks and passed or appearing in 1-year Bachelor in Education (B.Ed). Graduation with at least 50% marks and passed or appearing in 1-year B.Ed. (Special Education)*. Not Specified. Total No of Post 10000+ (Not Specified). 4.Upload the Scanned Copy of Documents in Prescribed Size and Format. 6.Online Application Can be Submitted on or Before 12th March 2019. Q. What is the Last Date For CBSE Teacher - CTET 2019 (Correction Form) Vacancy ? A. Last Date for CBSE Teacher - CTET 2019 (Correction Form) Posts is 12/03/2019. Q. What is the Form Type of CBSE Teacher - CTET 2019 (Correction Form) Recruitment ? A. The Form Type for CBSE Teacher - CTET 2019 (Correction Form) Posts is Online. Q. How many vacancies are available in Central Board of Secondary Education Teacher - CTET 2019 (Correction Form) Posts ? A. 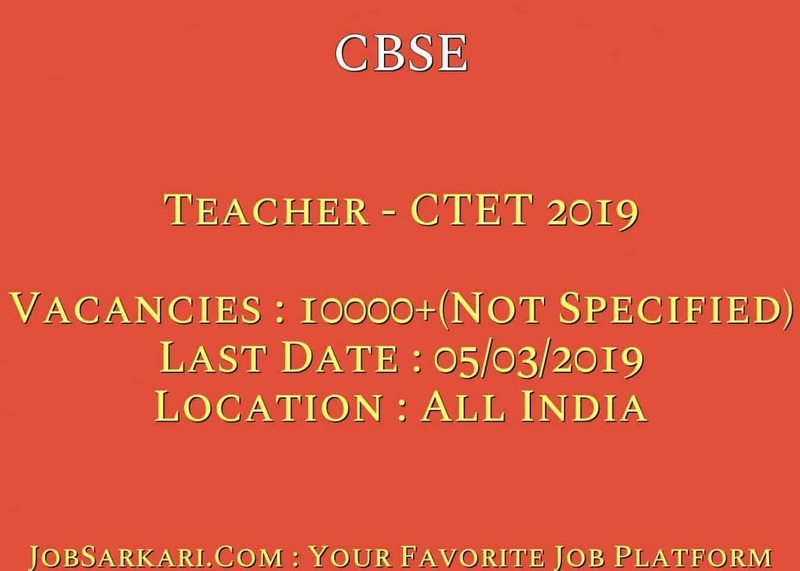 There are about 10000+(Not Specified) Vacancies in Central Board of Secondary Education Teacher - CTET 2019 (Correction Form) Posts. Q. What is the Full Form of CBSE ? A. Full Form of CBSE is Central Board of Secondary Education . sir link is not working ! it is sowing (Our servers are facing a temporary technical problem.We regret the inconvenience caused. Please try again after some time) so please help and how do apply. It May be Because of Website Problem Wait For sometime it will Be open again. Please Go through With notification And You Must Have Passed B.Ed For applying This Post. yes You Can apply for This Post And Please go Through with Notification. No You Can Not Apply for this Post. If you Have Have Completed B.Ed or Dled Than You Can Apply For this Post…..
You Can Apply For All 12th Pass Jobs Through This Link…..
Sir i have done 12th should i eligable for cbse CTET exam plz help.. Respected sir, pls give details about notification, even I am not received any notification or email. How to fill the online form and how can I apply for this job. Pls send me details sir. Thanking you. You Can Register Yourself Through A Link Given on Our Website Form That Link You Can Apply For this Post And Please Read The Notification…..
Bina CTET ke B Form Bhar Sakte Hain..